Rear Wheel Travel 119.3 mm / 4.7 in. Trail 103 mm / 4.0 in. Width 705 mm / 27.8 in. Height 1115 mm / 43.9 in. Wheelbase 1395 mm / 54.9 in. Seat Height 830.5 mm / 32.7 in. Thirty years ago, the Kawasaki 600 Ninja literally invented the 600cc supersport segment, which today remains one of the benchmark performance classes in the world. 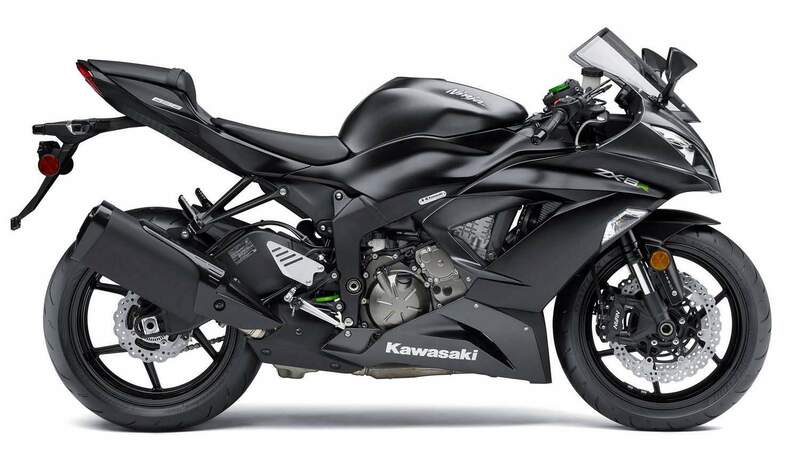 Now for 2015, Kawasaki celebrates three decades of racing wins and championships with a very special 30th Anniversary Ninja® ZX™-6R, the ultimate expression of the Ninja’s “Forever Fearless” attitude in the middleweight sportbike class. Building on the current ZX-6R platform, the 2015 edition features exclusive styling touches that uniquely identify it as the powerful descendent of the motorcycle that truly started it all. The 2015 Ninja ZX-6R story begins with the ultimate advantage over its 600-class competition – displacement. Offering 636cc vs. the 599cc of competing inline-four machines, the ZX-6R gives riders a significant 37cc increase in engine size resulting in much stronger low- and mid-range power, a premium asset for street riding, canyon carving and on-track authority. This performance advantage has been fully proven in the demanding arena of AMA Pro Road Racing, when the first revolutionary 636 blew away the competition’s 600s and won races against factory 750s on the track. This category-shattering heritage, passed faithfully down through the ZX-6R’s most essential DNA, still resides in the latest model’s 16-valve, long-stroke DOHC 636cc inline-four. This engine provides the exact riding experience demanded by the most discerning middleweight sportbike pilots. Torque rich and rev happy, the supremely powerful engine easily makes the transition from everyday city streets to the wide-open racetrack, making its broad spectrum of performance available to every rider. In fact, the ZX-6R powerplant is as happy breezing through the morning commute as it is tagging the rev limiter on the back straight, proving that the power capable of dominating on the track can also be smooth enough for everyday use. The key to this immense bandwidth is the ZX-6R’s unique long-stroke engine design. Its additional 37cc of displacement compared to competing inline-fours makes a significant impact on real-world riding. Increased performance throughout the rpm range is always welcome for vigorous sport riding or racing, but it also significantly enhances everyday usability. Thanks to the ZX-6R engine’s larger displacement, low- through mid- range torque is significantly stronger and the engine’s total “area under the power curve” grows substantially when compared to traditional 600cc bikes. Intake and exhaust port shapes are optimized to suit the displacement, helping to provide increased performance as well as improved throttle response. In particular, the intake ports are wider near the throttle bodies and split farther upstream from the valves, while the exhaust ports are wider near the valves and taper on their way to the exhaust header. The camshafts are made of lightweight chromoly steel, with greater intake duration and more intake and exhaust lift to complement the extra engine displacement. Meticulously finished piston crowns increase piston strength and accommodate the extra valve lift, while a molybdenum coating on the piston skirts fights friction and helps with engine break-in. Finally, the connecting rods are built to suit the kinetic energy of the long-stroke engine, and high-rigidity piston pins help ensure high-rpm durability. The airbox has a large internal volume tuned to help the engine produce maximum power with smooth delivery. Inside are four single-bore intake funnels that contribute to low- and mid-range torque production, with different inner and outer funnel pairs that further enhance engine character. The Digital Fuel Injection (DFI®) system’s ultra-fine atomizing injectors deliver a sub-60 micron fuel droplet size for optimum air-fuel mixing and maximum combustion efficiency, while precise DFI mapping enhances throttle response and reduces emissions. The end result is a 636cc engine that delivers class-leading drive out of corners, offers superior flexibility and precise throttle control. These virtues pay big dividends when making mid-corner power adjustments or stringing a set of curves together on a racetrack or twisting backroad. The ZX-6R’s heroic power is delivered through a high-tech F.C.C. clutch with assist and slipper functions. This advanced clutch design allows quick, effortless downshifts when scrubbing-off speed for a corner, while also helping minimize rear-wheel hop caused by excess back-torque. The design uses two types of cams, including an assist cam and a slipper cam, that were developed based on racetrack testing and expert rider feedback. The “assist” cam acts like a servo mechanism to pull the clutch hub and operating plate together, and compress the clutch plates under load. This allows the total clutch spring count and tension to be reduced, resulting in up to a 25% overall reduction in effort at the clutch lever. The assist cam also increases the clutch’s maximum torque capacity to help it cope with the 636cc engine’s extra power without adding to the overall component mass. Whenever back-torque is present, such as during rapid braking and downshifting, the clutch’s “slipper” cam reduces clamping force on the hub and operating plate to help prevent rear-wheel hop and allow for smooth corner entry. The spring plate assembly likewise offers smooth engagement and helps minimize vibration and clutch judder. In keeping with its racing DNA, the ZX-6R also employs a cassette-type six-speed transmission to simplify gearing changes at the track, help reduce the time needed for bike setup and allow more time for riding. Strong alloys and idealized gear thickness provide optimum gearbox durability, making it the perfect match for the torquey 636cc engine. 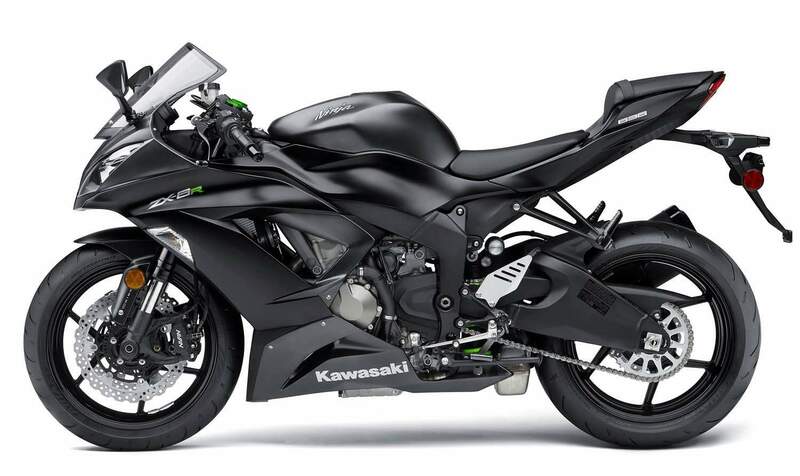 The Ninja ZX-6R features the most up-to-date sportbike and racetrack technology offered by Kawasaki. Its three-mode Kawasaki Traction Control (KTRC) system is similar to the KTRC unit found on the flagship Ninja ZX-14R, and features even more advanced programming than the S-KTRC system used on the ZX-10R superbike. And its selectable power modes offer numerous tuning options and maximum flexibility compared to the middleweight competition. The KTRC traction control system on the Ninja ZX-6R combines the best elements of the S-KTRC and KTRC traction control systems on Kawasaki’s two flagship sportbikes. Three different KTRC modes are selectable via a switch on the left clip-on. Mode 1 offers maximum racetrack performance, Mode 2 offers sporty street performance, and Mode 3 virtually eliminates wheelspin and improves rider confidence on slippery surfaces. Riders may also turn the system completely off for total manual throttle control. Just like the S-KTRC system on a ZX-10R superbike, the ZX-6R’s KTRC Mode 1 and Mode 2 prioritize maximum forward acceleration. To do so, sophisticated computer algorithms predict when available traction is about to be compromised, and then initiate KTRC intervention before slippage exceeds the optimum acceleration range. This minimizes how much power must be reduced to improve or restore rear-wheel traction, while also helping to provide maximum forward drive. Operating parameters are monitored and confirmed 200 times per second, with the system using only ignition timing to regulate the engine’s power output, allowing extremely quick response. KTRC Mode 3 features similar tuning to a Concours® 14 ABS sport tourer’s traction control system. During normal operation, Mode 3 uses the same logic and control method as Mode 1 and Mode 2, but immediately switches to three-way intervention – using ignition timing, fuel delivery and the intake tract’s sub-throttles – if excessive rear-wheel spin is detected. This allows Mode 3 to reduce engine output to a level that will allow the rear wheel to regain grip, even on very slippery surfaces. The fine control provided by the dual throttle valves also results in a very natural throttle feel and smooth transitions no matter how quickly the rider opens the throttle. This highly effective system uses minimal hardware paired with very advanced software programming that monitors various parameters and rider inputs. The only additional hardware required by the KTRC system is a set of front and rear wheel-speed sensors so it can calculate rear-wheel slippage. In sum, the overall effects of Modes 1, 2 and 3 are easy to distinguish from each other and effectively cover a wide range of riding conditions. Riders can select either “Full” or “Low” engine power modes via a switch on the left clip-on. The power modes allow quick adjustment the power delivery to help suit road or track conditions, or personal preference. Full mode unleashes the engine’s full performance potential. Low mode offers the same low-rpm power output, but begins to limit power as the rpm rises into the midrange and then offers only 80% of the engine’s maximum power. Low mode also delivers a softer throttle response, a handy feature when the rider wants to relax. Combining the KTRC and Power Mode options, riders have a total of eight combinations from which to choose, and each system can be independently set to match rider skill/preference, riding location and surface conditions. An experienced rider on dry pavement might choose “Full Power” and “KTRC Mode 1” for a trackday or club race, but in wet and/or slippery conditions, that same rider might choose “Low Power” and “KTRC Mode 3.” As noted above, the various modes are easily selectable from a convenient switch on the left clip-on. One-piece Nissin “monobloc” radial-mount brake calipers are highly rigid, offer excellent heat dissipation, and are 45 grams lighter than a comparable two-piece caliper. The monobloc calipers are paired with 310mm petal-type front rotors to help provide superb braking power, with great feel at the lever. Adopted from the ZX-10R superbike, the rear brake caliper helps offer good fade-resistance and optimum rear brake performance in conjunction with a 220mm petal-type rotor. The rear master cylinder reservoir mounts forward of the swingarm pivot to maximize free space around the footpeg. In addition, the rear brake pedal is coaxially mounted with the footpeg for excellent mid-stroke braking efficiency and optimum feel. The Showa Separate Function Fork–Big Piston (SFF-BP) combines the innovative concepts of an SFF and a BPF to deliver next-generation suspension performance. The fork utilizes springs on both sides, with adjustable spring preload in the left tube and adjustable Big Piston compression and rebound damping in the right tube. All adjusters are located on the upper fork caps for convenient access. Smooth initial stroke action and excellent composure under braking are decisive BP strengths. True to its “Big Piston” name, the large-diameter damping piston in the right fork leg is much bigger than the dampers used in traditional “cartridge” forks with the same external dimensions. Since oil inside a BP fork leg acts against a much larger surface area, the damping pressure can be reduced without compromising the overall damping effectiveness. Reducing the damping pressure also allows the inner fork tube to move more smoothly, which is especially noticeable during the initial part of the stroke. The result is greater composure as the fork begins to compress, and a less severe change in chassis attitude (reduced dive) during hard braking. The SFF-BP is primarily tuned for use on twisty roads, with the tuning also allowing a high level of performance at the racetrack, and comfortable response in the city and on the highway. Kawasaki’s patented bottom-link Uni-Trak® rear suspension offers 5.3 inches of travel and features a gas-charged shock with adjustability for spring preload, 25-position rebound damping and stepless compression damping. Linkage and lever ratios deliver impressive ride quality in both city and highway conditions. Lightweight twin-spar aluminum frame engineering places the engine in the optimum position for superb handling and rider feedback. It features a 23.5-degree rake angle that helps quicken steering response, enhance maneuverability and promote clear communication to the rider from the front tire. It also uses low friction steering-stem seals for more precise steering inputs and lighter handling at low speeds. The 2015 ZX-6R bodywork features highly aggressive design elements for a characteristic and unique Ninja appearance. Large fairing openings provide increased airflow and enhanced heat dissipation, while the fairing lowers, rear cowl and assorted blacked-out body panels contribute to the bike’s compact and lightweight appearance. Projector-beam headlights are encased in a sharp-edged housing that features integrated position lamps, and a sleek one-piece front fender adds to the excellent aerodynamics. Semi-flush front turn signals are built into the bodywork, and compact rear turn signals complement the minimalist tail section. The ZX-6R’s compact LED taillight is lightweight, very bright and offers a modern high-tech appearance. And finally, a “hugger” fender above the swingarm helps reduce aerodynamic turbulence and keep the undertail area clean. A critical feature for sportbikes, the ZX-6R’s seat, footpeg and handlebar relationship places the handlebars close to the rider and at an angle that promotes a highly intuitive and comfortable riding position. The fuel tank is flared around its top edge to provide a large leg and knee contact area, further contributing to the excellent chassis feedback. Together with a narrow lightweight aluminum rear sub-frame, the seat’s leading edge provides a slender and effective high-performance sportbike riding position, as well as a shorter reach to the pavement. This helps the Ninja appeal to an even wider range of riders. The crisp LCD instrument panel gives at-a-glance information to the rider, including an analog-style tachometer and a multi-function screen to enable the rider to select the combination of information displayed prominently. Primary functions on the LCD panel include KTRC, Power Mode and Economical Riding (ECO) indicators. Additional functions include a digital speedometer, odometer, dual trip meters, clock, instant and average fuel consumption, coolant temperature, as well as a shift indicator, traction control activity level, ABS indicator and low-fuel warning lights. A large gear-position indicator gives instant numerical gear confirmation. The mirror design offers increased rearward visibility without increasing overall vehicle width. A complete line of Genuine Kawasaki Accessories, specifically designed and engineered for the Ninja ZX-6R motorcycle, is available through authorized Kawasaki dealers. • Three-mode KTRC traction control combines the best high tech elements of the Ninja ZX-10R S-KTRC and ZX-14R/Concours® 14 KTRC systems. • Supersport models frequently encounter higher braking forces than less sporting models, so there is a greater likelihood of rear tire lift under extreme deceleration. By monitoring hydraulic pressure at the front calipers, KIBS is able to regulate pressure increases and help reduce the tendency of the rear tire to lift.